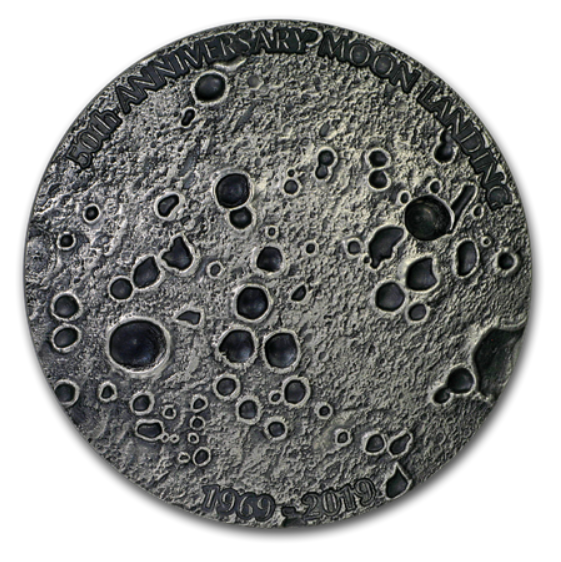 APPOLO 11 has forever marked the history of space conquest and the history of mankind. 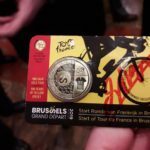 This is the reason why many National Mints around the world have decided to issue commemorative coins to celebrate this event in 2019, year of APPOLO 11 50th anniversary. 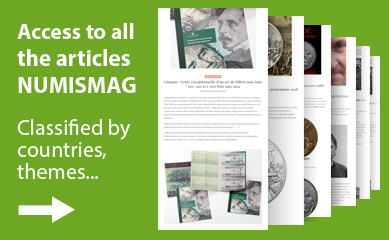 As we have done since launch of NUMISMAG, for this type of quasi-universal coin issues, our editorial team offers you an article that presents a summary of these issues, marking a major event in our common history. 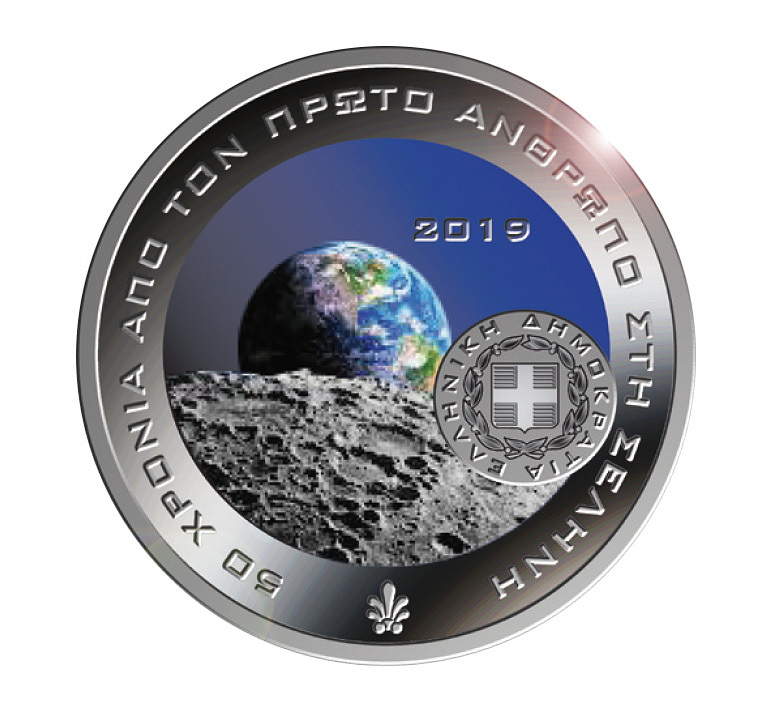 The article will be completed by new coin issues that will be announced worldwide. 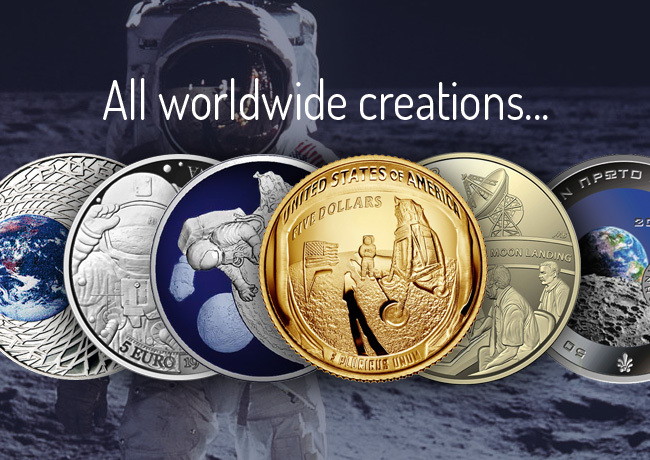 Australia has been very significantly associated with the History of Apollo 11. 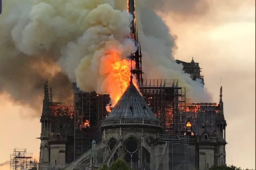 Indeed, the receiving stations that captured APPOLO 11’s radio and video broadcasts and then retransmitted them through the world were located in Australia. These were the Parkes and Honeysuckle Creek observatories in Australia. 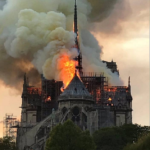 A third observatory located in the United States was also to receive Apollo 11 emissions, but what it received was unusable. 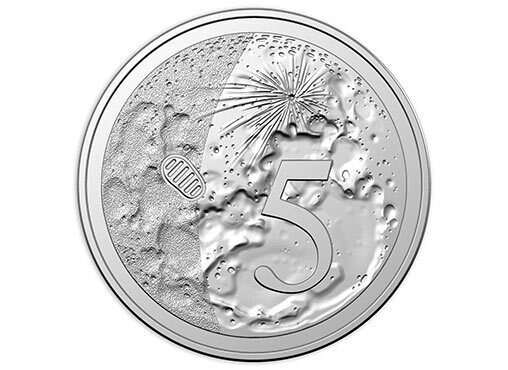 The images broadcast worldwide depicting Man’s first steps on the Moon were therefore images captured by Australian stations. 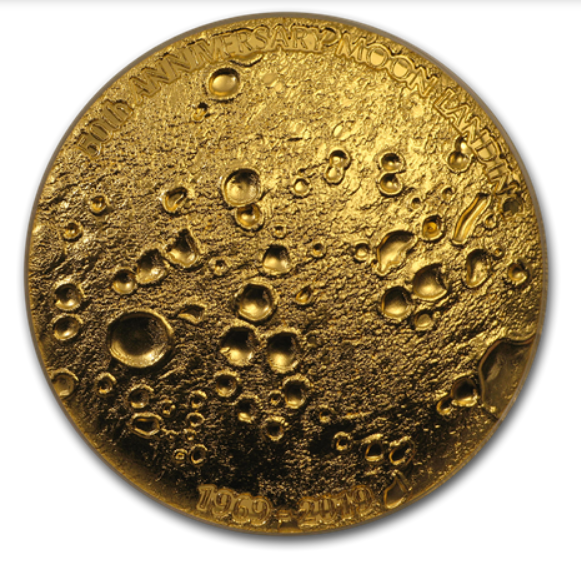 The Australian Geography Society had also reconstructed a new sequence of this adventure from a “pirate” record, kept by an Australian technician. 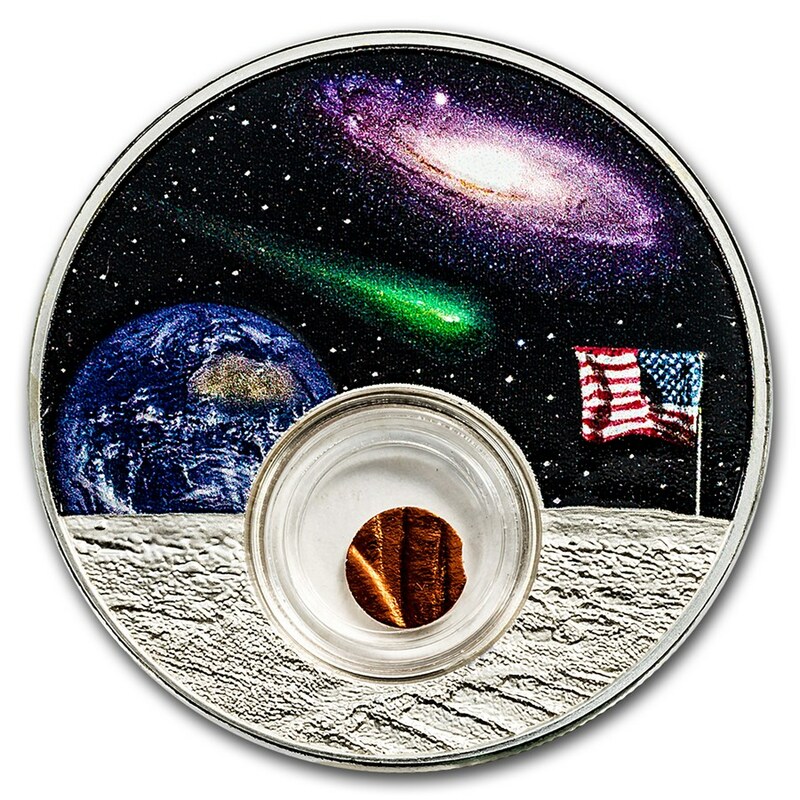 The original tapes had been returned in 1969 to NASA, which then reused part of them to record other Space missions… destroying the original recordings on these tapes! 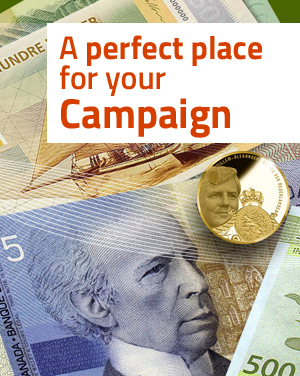 These coin issues are complemented by a coin set jointly developed by the US Mint and the Royal Australian Mint. 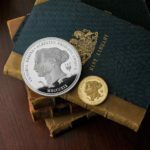 This is the first time that US Mint work together with another National Currency to design a commemorative coin set, according to the statements of the head of the marketing department of the Australian Mint, that the NUMISMAG team met in BERLIN in February 2019. 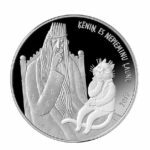 This set will contain a one US dollar coin of one ounce in silver and an Australian five dollars coin of one ounce in silver as well. 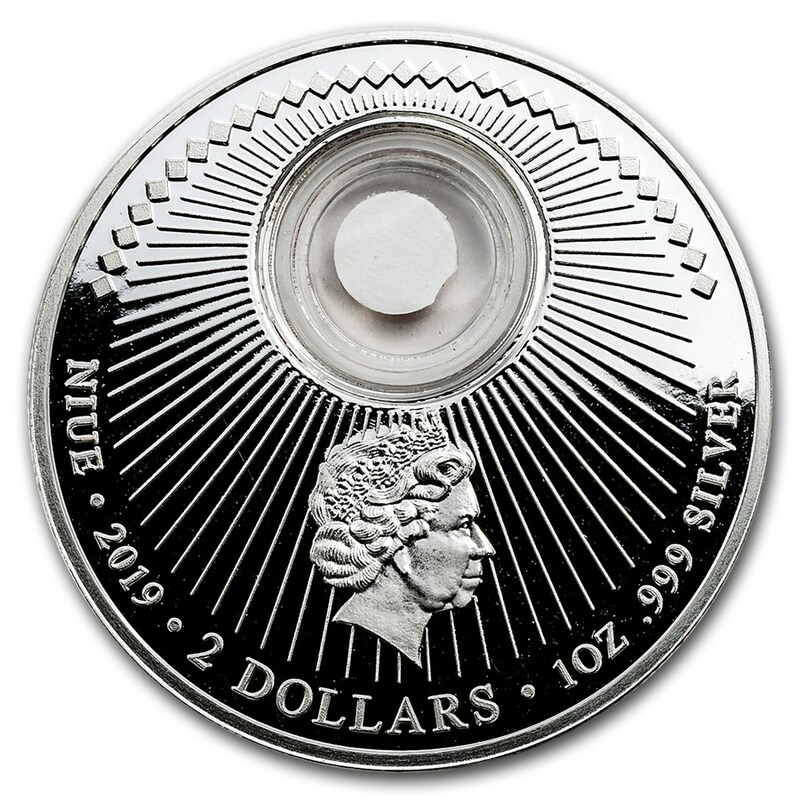 It will be marketed by the Australian Royal Mint. 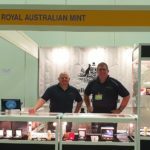 In addition, two coin sets, one in proof condition and the other one in BU condition, are issued by Australian Mint conteining the annual divisional series. 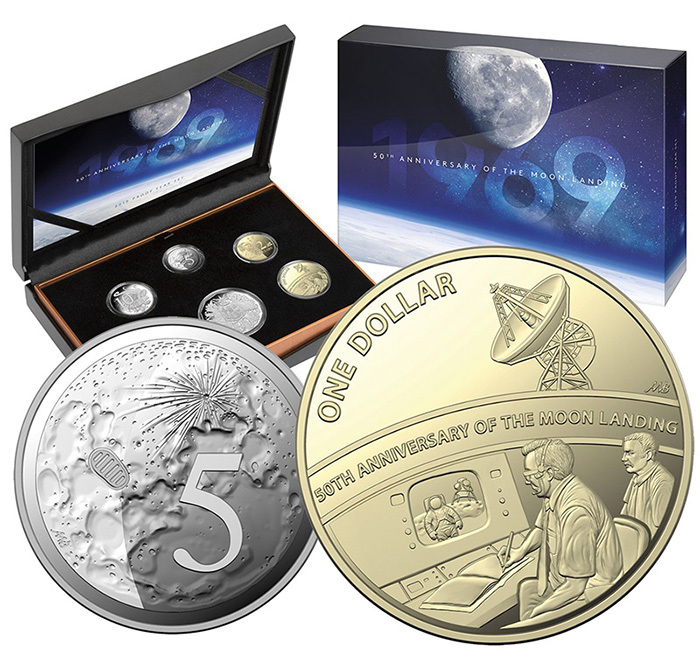 In these coin sets, the one-dollar coin is a commemorative coin celebrating the 50th anniversary of APPOLO 11. Two telecommunications operators in front of a screen are showing Neil ARMSTRONG, as he takes his first steps on the moon. 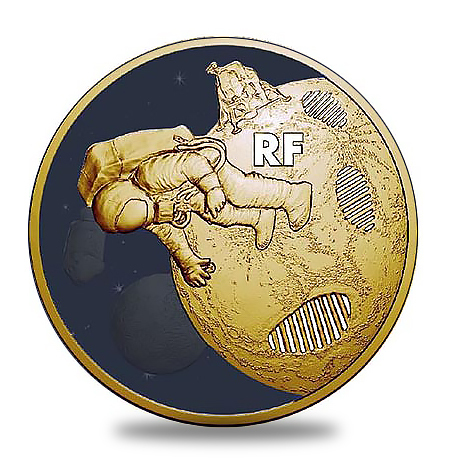 In the upper right field of the coin is the radio telescope of one of the two Australian observatories involved in the APOLLO 11 mission. 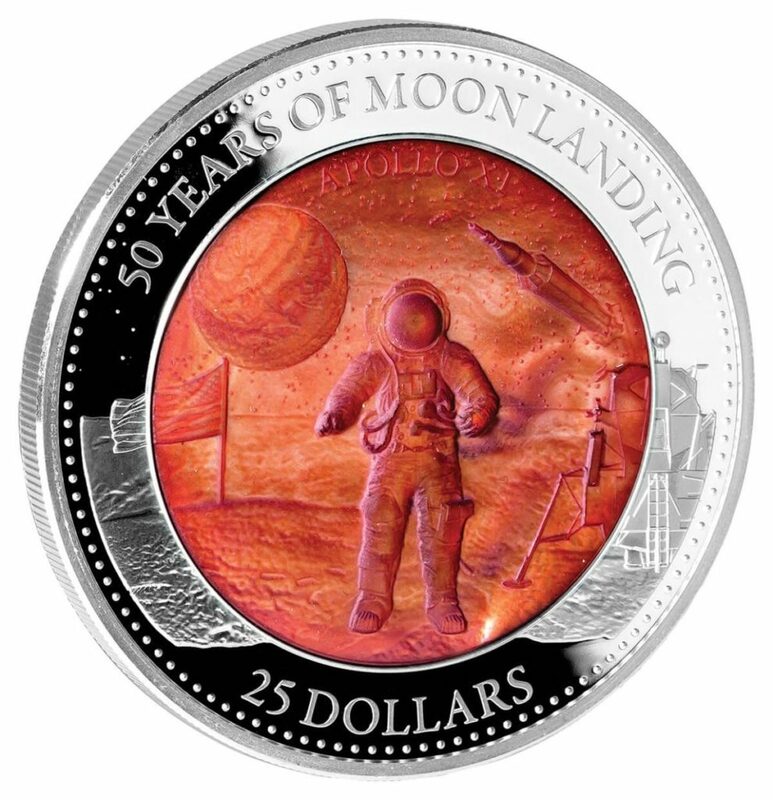 The 5-cent coin is also a commemorative coin illustrated by an aerial view of the Apollo 11 lunar landing site and a footprint of Neil Armstrong on the lunar ground. 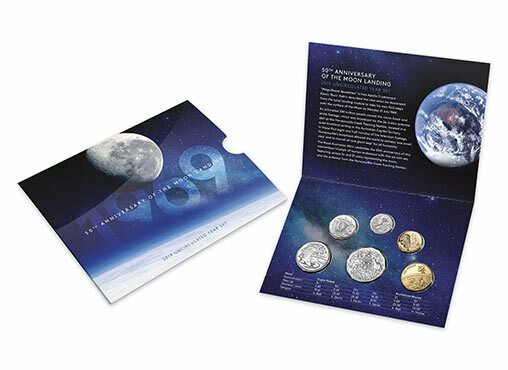 This is the first time an annual set contains a commemorative 5-cent coin. 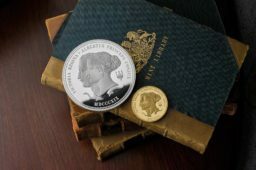 It is the first fully convex coin of the Austrian Mint. 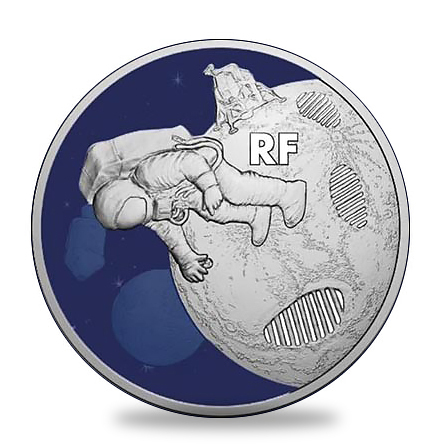 This means that one side of the coin is curved, as like as the real lunar landscape represented on it. 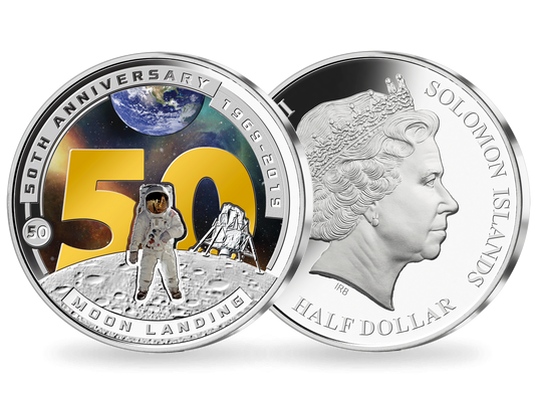 The other side is curved inward and includes the lunar module and an astronaut as well as tampoprinted planet Earth. It also shines in the dark. 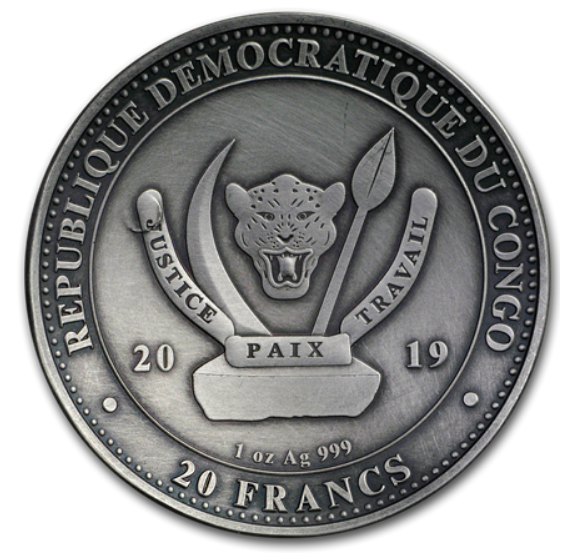 This coin weights a Troyes ounce . 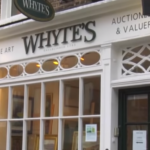 It is made of 999/1000 gold and is marketed by APMEX retailer. 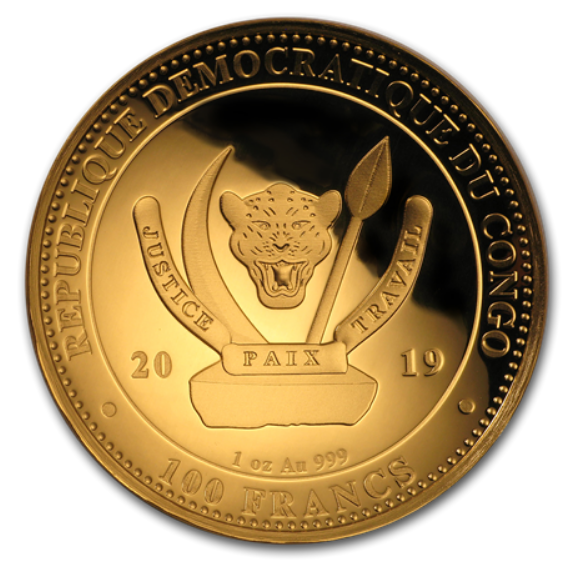 The mintage is limited to 100 coins. 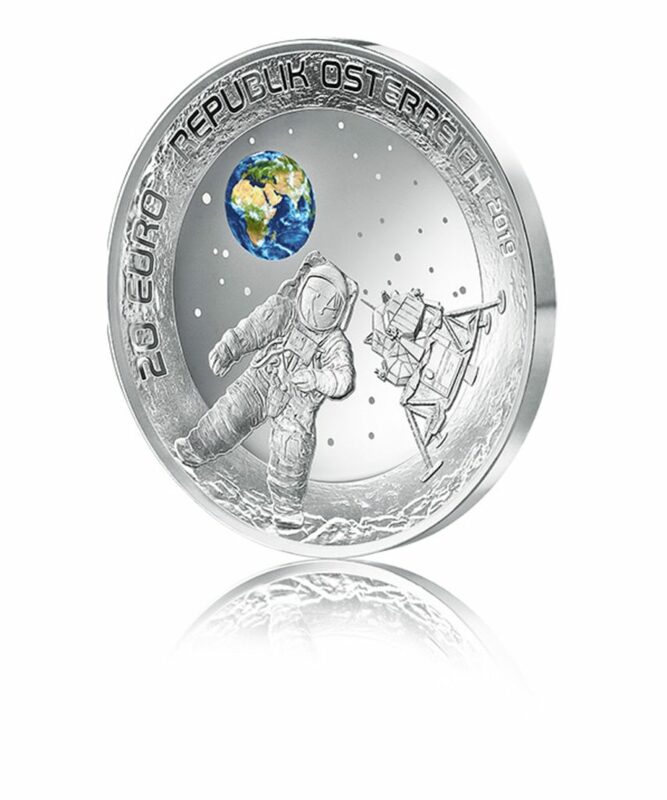 There is also a silver coin version. 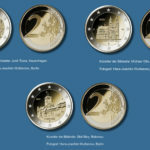 The mintage is limited to 1,000 coins. 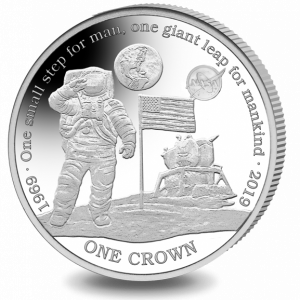 The United States Mint issued several commemorative coins dedicated to the 50th anniversary of Apollo 11 – Man’s First Steps on the Moon – in 2019. 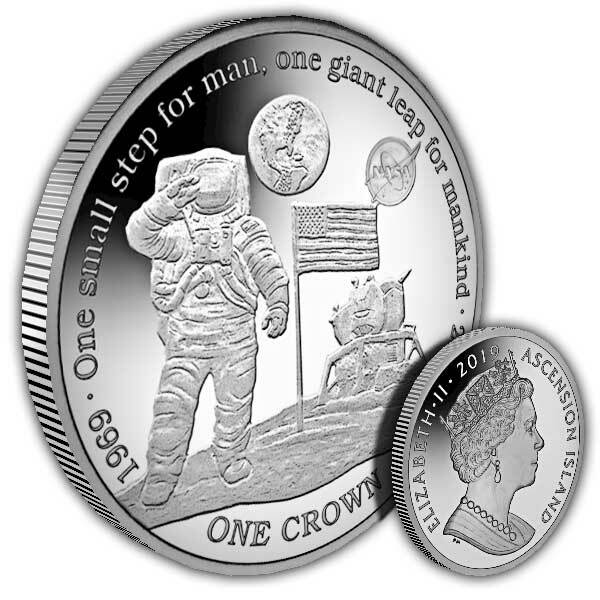 It is one of the most significant events in the history of the space conquest, the first manned landing on the Moon. 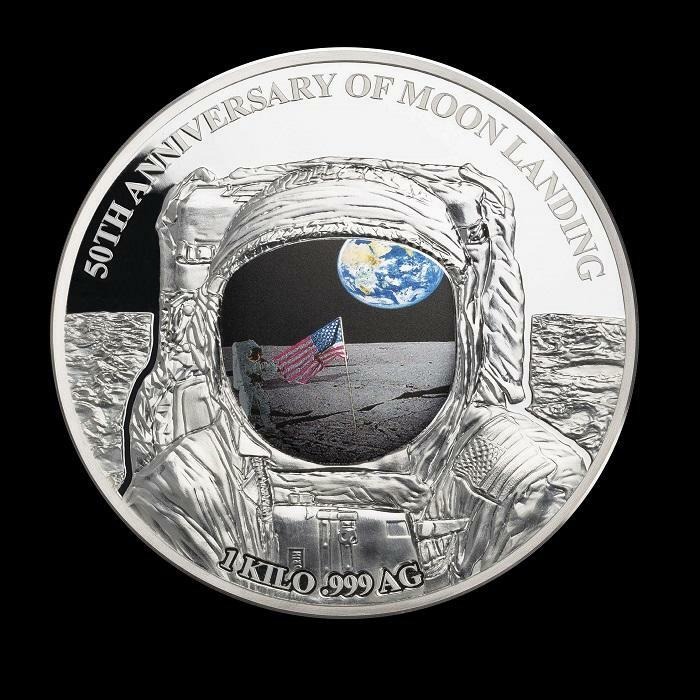 The challenge was launched by President John F. Kennedy in 1961 to “achieve the goal, by the end of this decade, of landing a man on the Moon and bringing him safely back to Earth”. 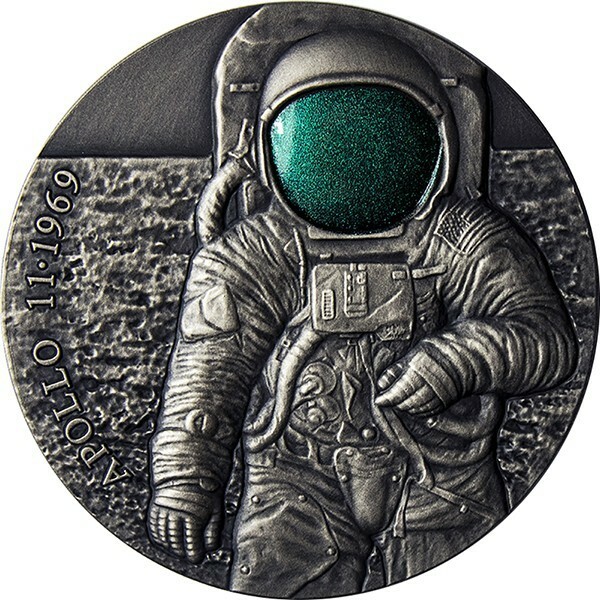 The objective was reached on July 20th, 1969, when Apollo 11 landed on the Sea of Tranquility on the surface of the Moon. 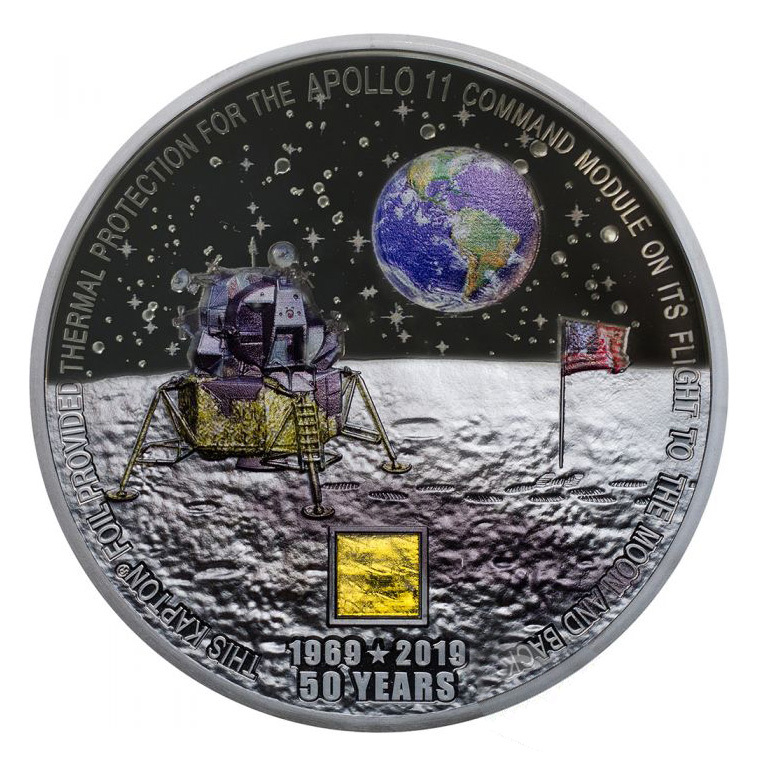 In 2019 the US Mint is honoring this historic achievement with the commemorative coin program for the 50th anniversary of Apollo 11. 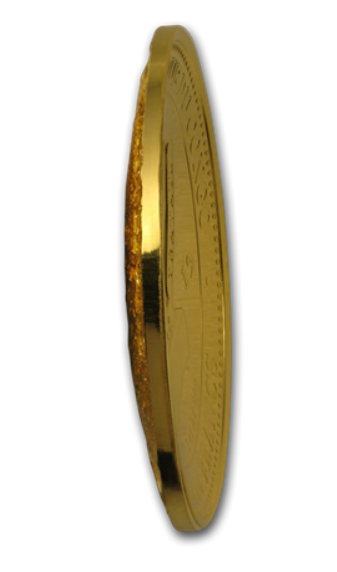 The program includes convex pieces in gold, silver and plated silver. 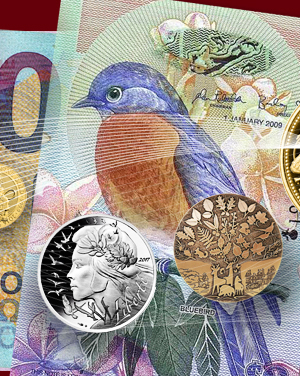 From this year onwards, the standard title will be AG 999/1000. 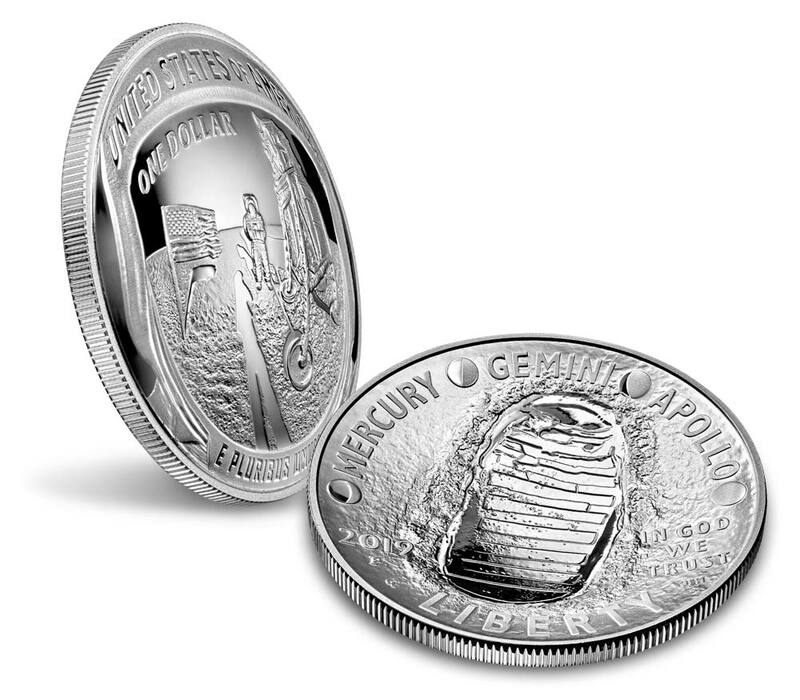 The previous commemorative silver dollars were in AG 900/1000. 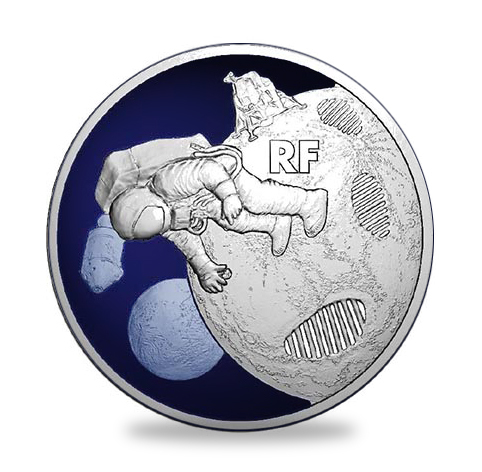 On the obverse, the visual of the American coin series represents ARMSTRONG’s first steps on the Moon through the reflection of an image on the helmet visor of another astronaut of the APOLLO 11 crew, BUZZ ALDRIN. 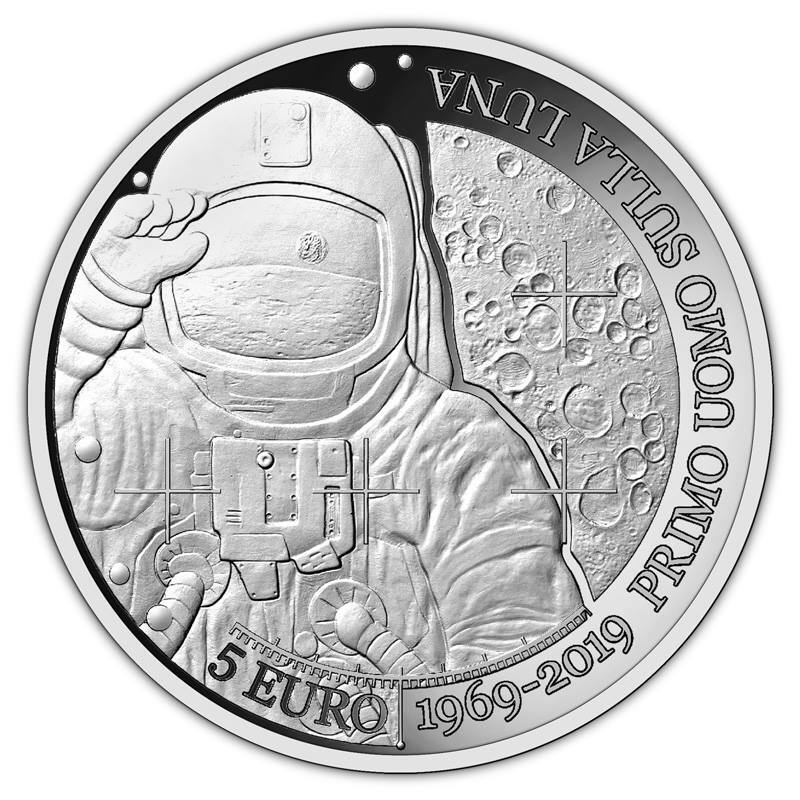 It is based on a famous picture “Buzz Aldrin on the Moon”, taken on July 20th, 1969. 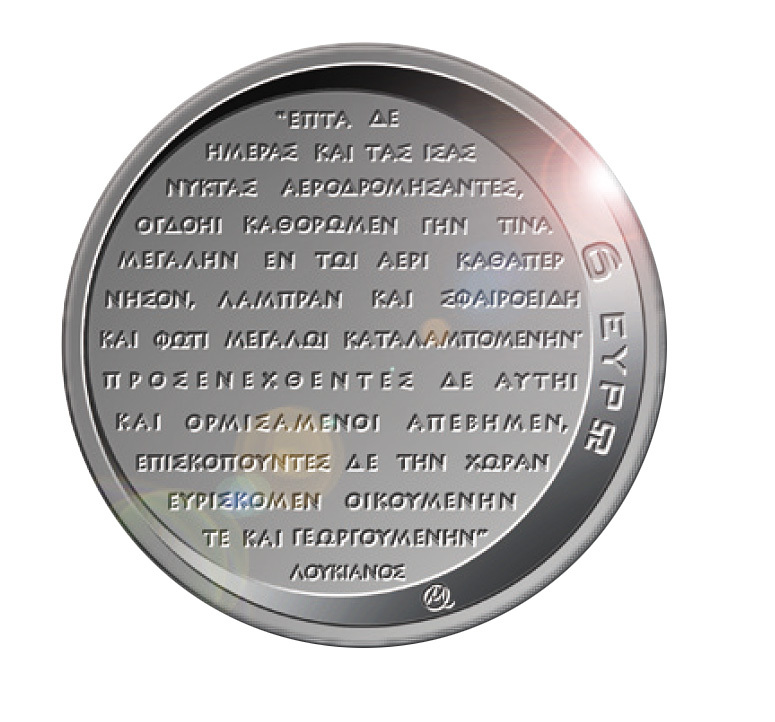 This is the reason why the obverse of this coin is convex. 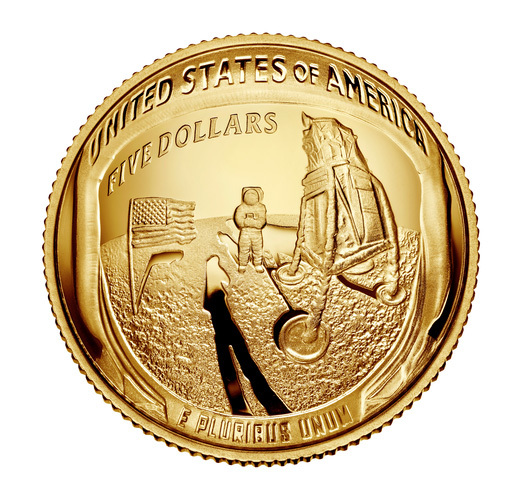 On the reverse is engraved a print of NEIL ARMSTRONG on the lunar ground, symbol of the success of APPOLO 11. 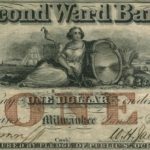 A reminder of the previous MERCURY and GEMINI projects is mentioned on the upper coin ciconference. 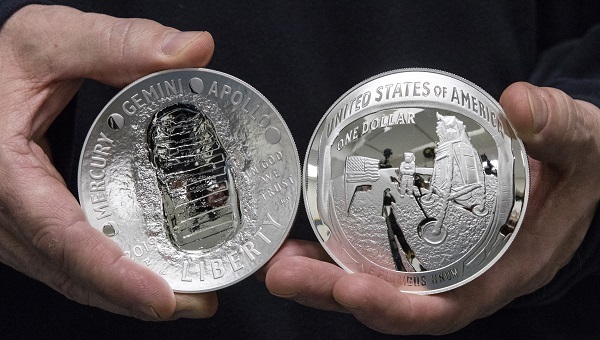 The two sides of the 2019 silver Apollo 11 5oz. 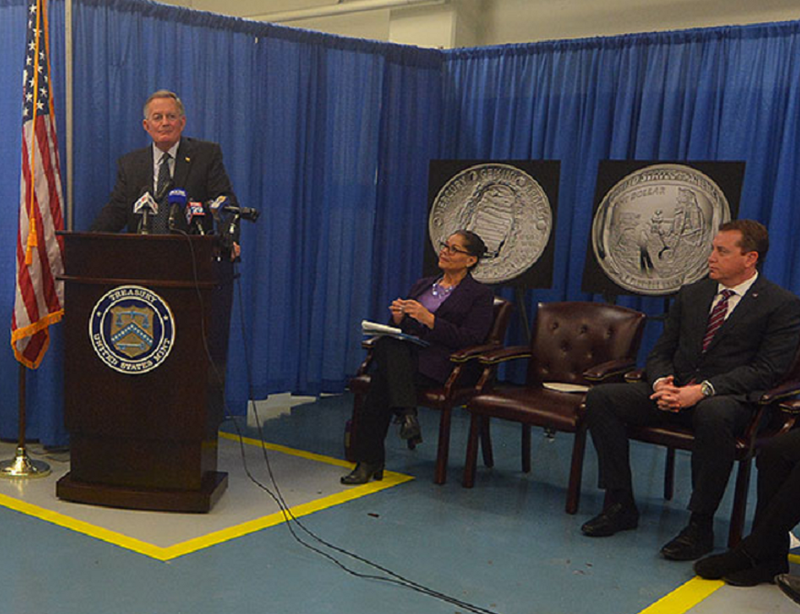 are presented at an official “first coin strike” ceremony at the United States Mint in the Philadelphia Mint workshop on Thursday, December 13, 2018 (AP Photo/Matt Rourke). 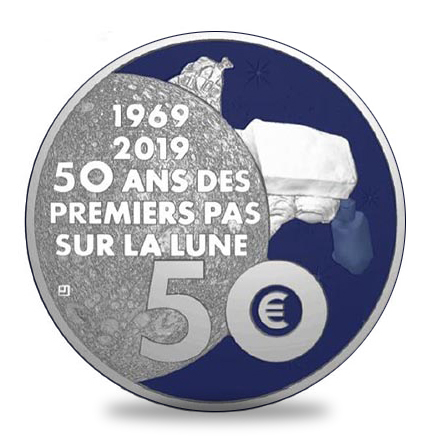 On the obverse, a composition of earth and moon colours was made with the space-time network in the background. 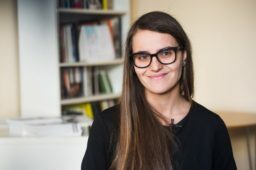 Above and below are the respective words “REPUBLIC” and “ITALIAN”. 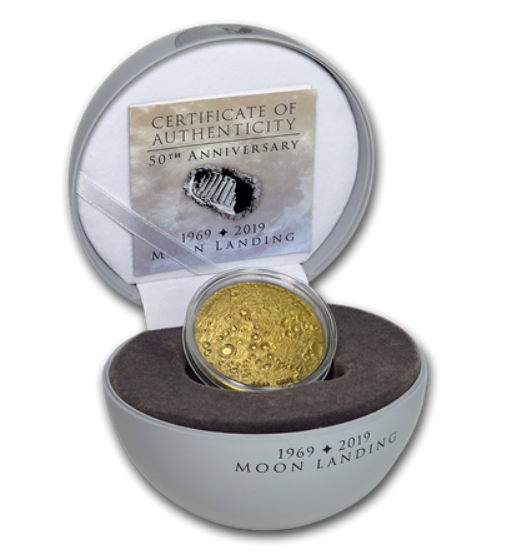 On the reverse side is the footprint left by astronaut Armstrong on the lunar ground after the moon landing on July 20, 1969. The Earth is in colour and stands on the horizon. 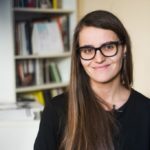 The engraver is Claudia MOMONI. 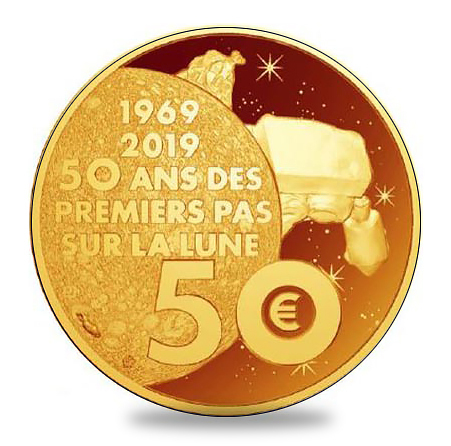 The famous sentence of the Astronaut is also reproduced, pronounced when he has just landed on the Moon: “A small step for a man, a giant step for Humanity”. Part made of a blue-night through resin. 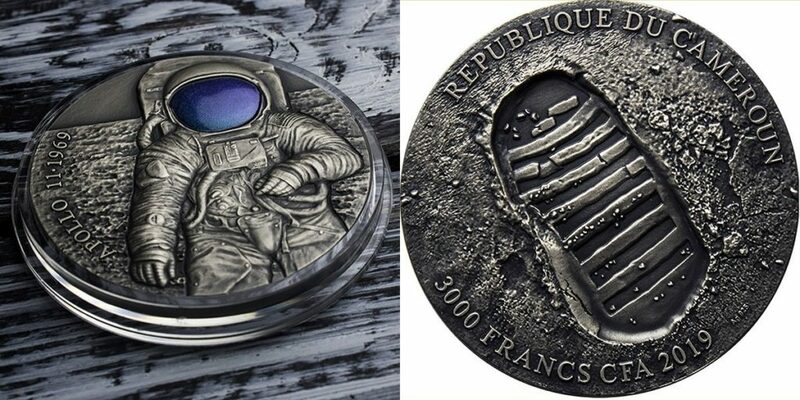 During producing process, the coin will be hollowed out in most of the blank to make way for this blue resin. The part is not hollowed out. The blue resin is placed on each side in a reserve. 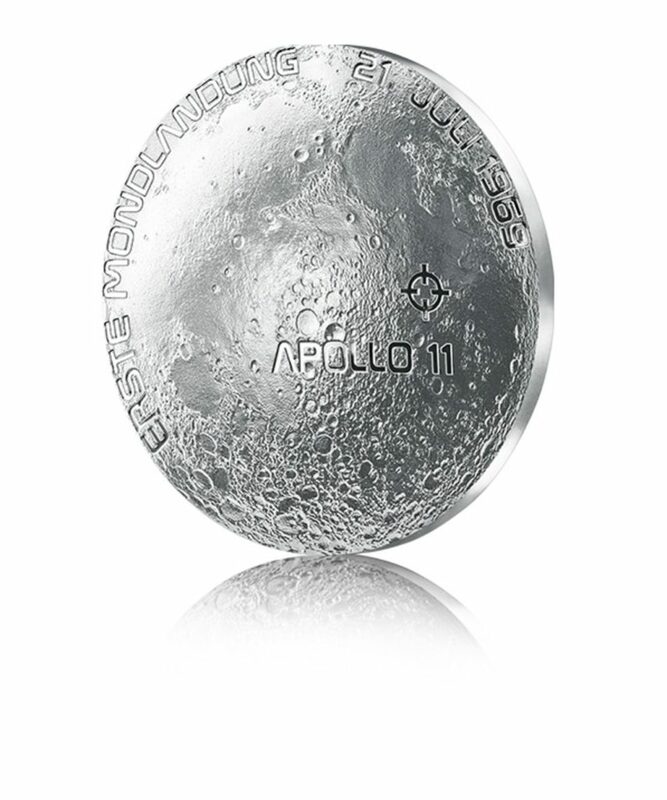 You can see the earth and the Apollo capsule through it. On this version there is no blue resin. 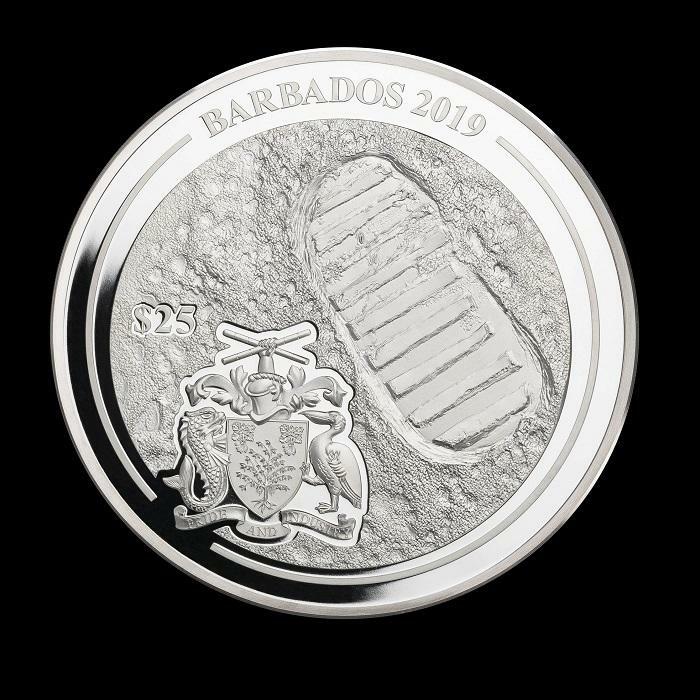 The bottom of the coin is treated with a glossy polished finish. 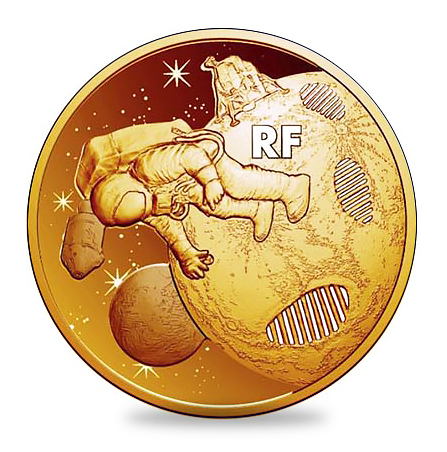 The other parts of the coin and in particular the stars are treated in matt finish. 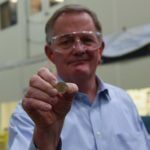 The coin is not hollowed out. 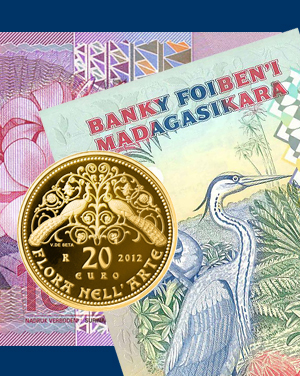 The blue resin is placed on each side in a reserve. 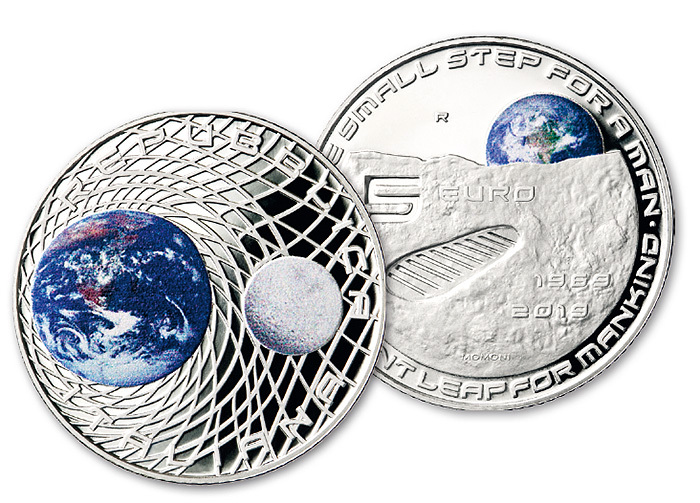 The earth and the Appolo 11 capsule are visible by transparency. 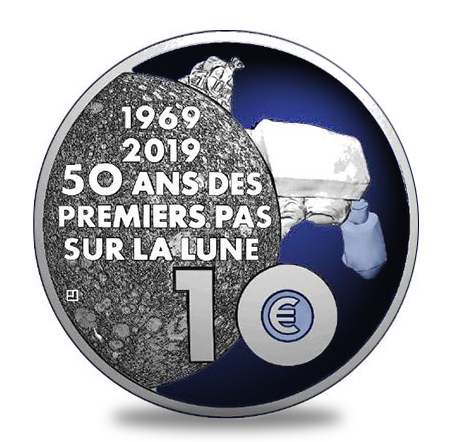 The entire series of French coins was designed by Joaquin JIMENEZ, Creative Director of the Monnaie de Paris (french Mint). Island in northeastern New Zealand, at the centre of a triangle formed by Tonga, Samoa and Cook Islands. Sources: Monnaies Nationales et NUMSMAG©.